600gsm paper. Beautifully textured and thick. With free envelopes included. Our extra-thick Luxe Notecards are made from archival-quality Mohawk Superfine. With its beautiful formation and uniformity, nothing prints better – and it means they’re a pleasure to write on. Guaranteed to make your messages mean more. 1. Uncoated, naturally textured Mohawk Superfine paper. 2. Your choice of 8 seam colours. 3. 600gsm paper, double thickness for extra impact. Make sure that your background extends to fill the bleed to avoid your Notetcards having white edges when trimmed. How soon can I get my Notecards delivered? In as few as 4 business days. What size are your Notecards? Notecards are 105mm x 148mm. Do Notecards come with envelopes? Yes, our Notecards come with free white envelopes included. 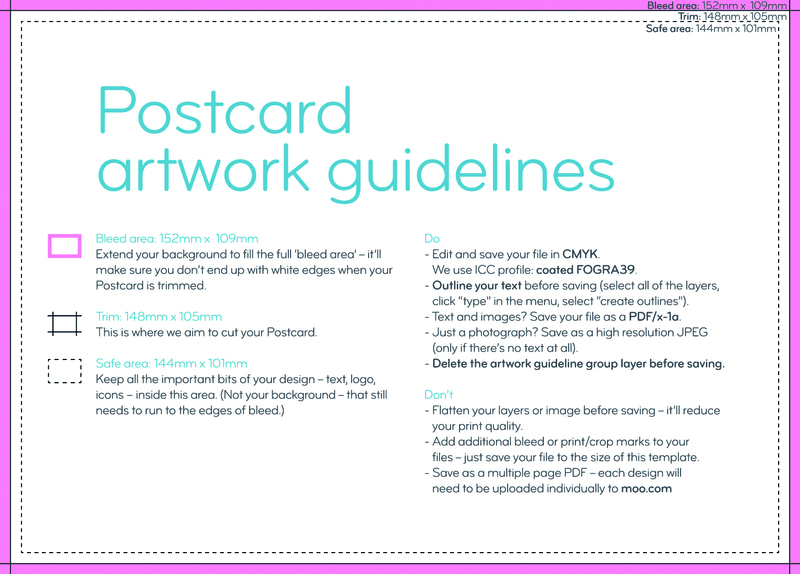 Why use MOO's Notecards printing service? MOO Notecards come in a remarkably high quality stock (with coloured seams) that shows how much you value the person receiving it.